My name is Simone Scott. 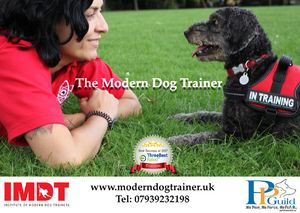 I am a certified dog trainer based in Hampstead, London. I have trained extensively with The Institute of Modern Dog Trainers and I am a member of The Pet Professional Guild. My clients range from new puppy owners, fearful rescue dogs and high profile celebrities. I am confident in the knowledge that I train dogs correctly, effectively, humanely and can help you with any issues or behaviour modification you may feel your dog needs. I am fully insured and DBS checked.